Can Security Be a False God? It’s interesting that false gods often begin existence as gifts, blessings of one kind or another to help us on life’s journey. So what turns a gift into a false god? When does the blessing become inauthentic? I think the answer lies in the degree of possession. I know that I am given everything I need for personal growth but, like manna in the desert, those gifts can turn bad if they are hoarded and jealously guarded. Take security for example. We are born with a primal instinct for survival. It is a part of our gene code. As new infants, we flinch at loud noise, cry when we experience hunger and discomfort. In early childhood it is our fear that helps keep us safe. We reject food that tastes unfamiliar. We are afraid of monsters in the dark. In moments of uncertainty, we run to our parents. Fear might be an uncomfortable emotion but it is the gift connected to our survival, and an important gift, at that. Somewhere early along the road, we start pushing back the boundaries of fear. Children seek adventure, new skills, daring games that occasionally result in fractured limbs but almost never broken spirits. Parents can become alarmed at a child’s appetite for horror films and reckless sports. Just as fear is instinctive, so too, does the growing child need to actively meet fear face to face and stare it down. It would be convenient if we naturally outgrew fear. That doesn’t happen. In adult life, the survival instinct, operating as the ego, still uses fear to protect itself; but in the adult world, fear has learned to wear a socially acceptable disguise. It often parades as virtue. We would all know that a certain amount of caution is both healthy and necessary. Again, it is a matter of degree. We also recognise that evil in the world is a distortion of the animal instinct for survival, that ‘me first’ instinct out of control, and nearly always it dresses itself up as goodness, justice, even holiness. Society knows how to put a layer of gold leaf on fear and make it an object of worship. The gift becomes a false god. We are aware of what Jesus said about the worship of security, whether that be related to power, material possessions, status, law or even our own ideas. Jesus advocates an insecurity that can sound threatening to us. He who loves his life will lose it. Take up your cross and follow me. Except a grain of wheat dies it remains a single grain. Do not gather treasure on earth. It all sounds so miserable! But some time in midlife, when we can reflect on the road behind us, we begin to see the wisdom of insecurity. We realise that some of the protective fences we’ve built around ourselves have become prison walls that can restrict us and shut out a greater freedom. As children we needed to deal with our fears in order to inhabit a wider place in society. Now, in maturity, the process begins again, this time bringing us to a larger place in our spiritual life. Far from being threatening, taking down the fences of fear is the most liberating thing we can do for ourselves. It frees us for the greater love that Jesus talked and lived. 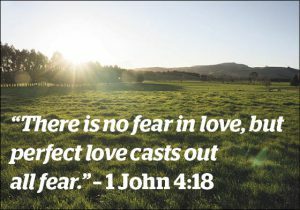 We know how our hearts respond to the words in the St John letter: ‘There is no fear in love but perfect love casts out all fear.’ That resonates in us as truth; but our fears have grown subtle. They too, claim truth. All that gold leaf! How do we recognise the false god beneath it? I believe that I must do this inner journey in the company of Jesus, guided by his compassion, love and gentleness. It is a positive journey. Judgmental attitudes come from fear and when we lay criticism on ourselves, we compound our problem. Simple awareness is usually enough. What is it within us that feels tight and restrictive? What thoughts harden our lovely soft hearts? What ideas do we hold in a tight fist? What takes us forward on our sacred journey with Jesus, and what holds us back? Where is the clutter in our lives and how do we name it? How do we fill that inner emptiness that was created for God? When we become aware of our false gods, they usually melt away by themselves. But that is not to say we won’t make new ones. We will. Of course, we will. That’s what it means to be human. But with ongoing awareness, we can look kindly on our infantile needs, laugh at our performing ego and let the false god of security diminish with neglect. Is it really so simple? I think it is. It’s the tension caused by fear that can make life complex. We are all little souls that must learn to replace fear with love, and that is the job of a lifetime. And if the way at times seems difficult, then we have the great comfort of knowing that we never walk alone. Emmanuel. God-is-with-us.